The legendary Ethnic Heritage Ensemble, has toured internationally, as well as recorded numerable celebrated projects over the last 45 years. 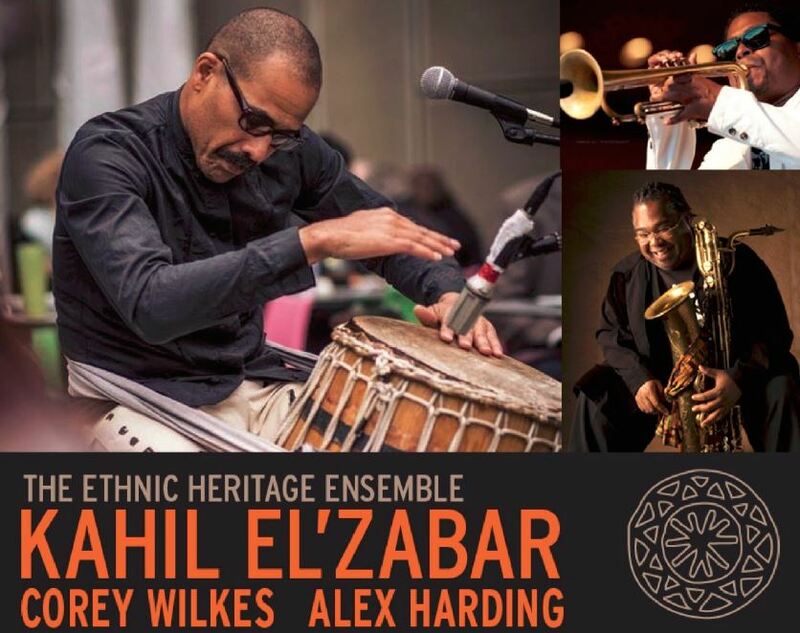 The current line up, featuring Corey Wilkes (trumpet), Alex Harding (baritone sax) and the band’s founder, Dr. Kahil El’Zabar (multi-percussion/ composition), is guaranteed to inspire audiences. Dr. Kahil El’Zabar is considered by his peers to be one of the most prolific innovators of his generation. He has recorded more than sixty well–received projects, and won numerous international awards as a musician and composer. In 2014, Mr. El’Zabar was knighted by the Counsel General of France, and christened as a “Chevalier Medal of Letters”. In 2012, President Barack Obama’s administration awarded him the International Ambassador’s Award in the Arts. In 2006, The Chicago Tribune named Kahil El’Zabar Chicagoan of the Year. In 1994, President Bill Clinton appointed El’Zabar to the National Task Force on Arts in Education. Mr. El’Zabar has worked with such luminaries as Dizzy Gillespie, Cannonball Adderley, Stevie Wonder, Donnie Hathaway, Pharoah Sanders, Neneh Cherry, Nina Simone, Ntozake Shange, David Murray, Nona Hendryx, Lester Bowie, and the extensive list goes on and on. Dr. El’Zabar holds a PHD in Inter–Disciplinary Arts from Lake Forest College (2006), and is Executive Creative Director and Director of Curriculum Planning/Teaching and Music Strategies at the new Chicago Academy of Music. He has also taught and held the position of Associate Professor at the University of Nebraska (Lincoln) and at the University of Illinois (Chicago), and served on several prestigious panels such as the National Endowment of the Arts, the NPN (National Performance Network) and the Lila Wallace Reader’s Digest Fund. 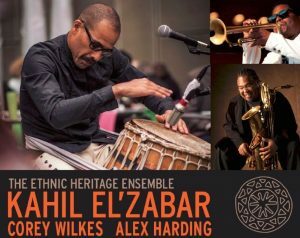 El’Zabar is a former Chairman of internationally acclaimed, AACM (Association for the Advancement of Creative Musicians). Corey Wilkes has established himself as one of the best improvising trumpeters in the modern era. Having the skill to approach mainstream repertoire of jazz standards with his own unique sensibilities, he combines them with his deep appreciation of hip–hop. Mr. Wilkes continues to bring his brand of musicianship and talent to the forefront of the genre. He has also shared the stage with numerous jazz masters including but not limited to; Wynton Marsalis, Roy Hargrove, James Moody, Kurt Elling, Von Freeman, Greg Osby, Roscoe Mitchell, Marcus Belgrave, Clark Terry, Harry “Sweets” Edison and Mulgrew Miller. His soulful notes can be heard gracing a variety of contemporary projects including sets by DJ Logic, Osunlade and Josh Deep; tracks on Hidden Beach Recordings Presents: Unwrapped Vol. 4, Kahil El Zabar’s Ascension Loft Series as well as Nona Hendryx, Soulive, Meshell Ndegocello and Ledisi. Alex Harding is considered one of the top baritone players in New York City. He has been a fixture on the New York jazz seen since 1993 performing touring and recording with the Julius Hemphill Saxophone Sextet, Hamiett Bluiett Baritone Nation, David Murray Big Band, Oliver Lake Big Band, Craig Harris, Joseph Bowie’s defunkt, Aretha Franklin, David Lee Roth, Lester Bowie, Andy Gonzales, Muhal Richard Abrams, Jayne Cortes and the Fire Spitters, Abdullah Ibrahim and the Tony award–winning Broadway show Fela! Alex Harding has several recordings of his own as a leader as well as sideman with other artists. Limited space… Please purchase early and arrive early to secure your seats.